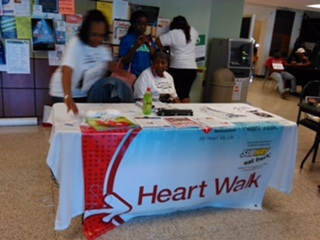 A Walk You “Cam” Remember was in honor of 20-year-old, Cleveland native, Cameron Sebastian Griffin, who died on July 7, 2015 due to heart failure. The walk happened on Thursday, April 28th from 12 p.m.-2 p.m. on the Delta State Green Mile Trail. His mother Ellen Griffin said this walk is for Cameron, and on behalf of Anna Claire, and everyone else who has died or been affected by any tragedies in their life. Mrs. Griffin gave out free wristbands. T-shirts were sold for $10 and can still be purchased. Anyone can contact Mrs. Griffin at 662-588-6300 for more information on purchasing a T-shirt. She said they are just trying help them to continue their research and to make a difference in everybody’s lives. The walk was co-hosted by Griffin’s sister-in-law Carolyn McDale and The Community Development Student Organization. News channel WXVT CBS 15 was there to cover the walk. Griffin was a junior Computer Information Systems major at Delta State University before his passing. Griffin had a passion for Art and truly enjoyed and loved drawing. Griffin experienced a seizure last Spring semester in the cafeteria on campus on May 7. He was rushed to the hospital and had three exams: an EKG, Cat scan, and a Spinal tap. Mrs. Griffin was told that every examination was normal and he was discharged. It was only two months later that Griffin died in his sleep and was found by his sister Meagan, who is a freshman pre-nursing major at DSU. Mrs. Griffin said she came to campus with her daughter Meagan for a freshman orientation. While eating in the cafeteria, she asked the cafeteria director if they had any positions available, so she could get closer to her children and supplement her income, since she is a single parent after the death of her husband three years ago. Mrs. Griffin said she had mentioned the walk-a-thon to Najawon Wilson and other students about three or four months ago. She said that Wilson did not forget and brought in fliers that he had made for the walk-a-thon. “That says a whole lot about people in general, how they have really come together interceding on Cameron’s behalf and on my family’s behalf,” she said. Mrs. Griffin said she is in a speechless mode, dumbfounded mode, and excited. “I am so grateful that we have the love and support from DSU and the students,” she said. Griffin’s siblings are Allena and Meagan Griffin, Courtney Edmond, and Willie Griffin III. Mrs. Griffin wants to thank everyone on behalf of Griffin’s siblings, his two nieces, Malia Stokes and Raelyn Lakes, his grandmothers, Corine Griffin and Lula B. Atkins, and his grandfather, Willie Griffin Sr.
Everyone tells Mrs. Griffin many wonderful stories about her son. Mrs. Griffin recalled people telling her about her son giving rides to the store without charging anything. She also recalls several people telling her that her son repaired cracked screens on cell phones. He fixed them for free if any student did not have the necessary funds available.